When I heard about #MendItMay, launched by Jen Gale at My Make Do And Mend Life I decided that we would dedicate May’s Wardrobe Wisdom blog to repair in support of this brilliant 'celebration of mending' initiative. So, who to interview? Which style-loving sewing fan loves mending as much as I do? Whose wardrobe wisdom would I like to share? There could only be one person – designer, pattern maker and mender extraordinaire Emily Hundt. Long-term readers and friends of The Good Wardrobe may remember Emily as she used to work with me here. She came on board just before we launched at the end of 2012 and she has since been a huge inspiration to me. I learnt so much from working with her and am so happy to see her launch the exciting new online pattern business In the Folds. We would love to know more about In the Folds – why did you set up the business and what is the ethos behind what you do? The story behind In the Folds is a bit of a convoluted one, which actually involves The Good Wardrobe. I completed my Bachelor of Design in Fashion and Textiles in Sydney in 2011 and had absolutely no idea what I wanted to do with my life, except that I wanted to see the world. I saved up as much money as I could and the next year I moved to London with nothing but a 15kg backpack and a dream to “find myself”, as clichéd as that sounds! Within my first few weeks in town I started an internship at The Good Wardrobe, as well as starting a production based internship - using my hands has always been a must for me. While at The Good Wardrobe I discovered sewing blogs (through this interview in Tilly and the Buttons) and couldn’t believe I had been oblivious to the online sewing world until then! I became well and truly obsessed, following countless blogs and reading them religiously. I soon decided it was time for me to start my own blog. I started Em Makes Patterns soon after and got to work documenting my journey into pattern making. I couldn’t believe how much I enjoyed creating tutorials and sharing my skills with others online. I would receive emails from all over the world saying that they’d learned a new skill from my blog. I found it hugely rewarding and inspiring to be able to share my skills and knowledge in this way, and learned so much myself in the process. By this point I had also discovered the world of independent pattern companies. After being brought up using Big Four patterns, I found it incredible to see women just like me starting businesses from their basements - producing modern patterns with fantastic instructions that went beyond the detail I’d ever seen in a commercial pattern. After an incredible two and a half years in London, sadly my jaunt came to an end and it was time to come home. I found myself back in Sydney without a job and with an idea planted firmly in my head, which I just couldn’t let go of. I realised that this was a perfect time to just give starting my own business a go. In October 2015 In the Folds was born. The ethos behind the brand is to create beautiful sewing patterns with unexpected details that teach you new and interesting sewing techniques as you make them. I want you to finish up with a beautiful garment, as well as a handful of new skills to help you along with future projects. I really want to encourage people to enjoy the process of making their own clothes - to really slow down and engage with their garments and the processes that are involved in making them. I think that half the battle with clothing bought from the high-street is getting the right fit. When you make your own clothes you can get them fitting like a glove, which is really refreshing if you’ve ever struggled to find things that fit properly. This is something I think about a lot when I design. How will women feel in my designs? What skills will they learn? Will they feel comfortable? Will it suit their lifestyle? I use all these questions to help me design garments that are truly wearable and accessible to real women. What are your top wardrobe care tips? Washing and drying clothes puts a lot of stress on the fabric. Only wash your clothes when they really need it and always dry them on the line. Driers can be lethal! Instead of machine washing your clothes so frequently, try spot removing between loads (this one is good for our wardrobes and our planet). Learn a few basic mending techniques - sewing on a button, reinforcing a seam and patching a hole. They're super simple techniques but can be applied to almost all wardrobe malfunctions. Learn by asking your nan, your neighbour, looking online - there are so many incredible blogs and YouTube videos out there - or getting a book from the library. You will feel so proud of your new skills, I promise! Always remember that the old saying 'a stitch in time saves nine' is so true. Mend your clothes (or at least banish them to the mending pile like me) as soon as you see they need some TLC. There's nothing worse than spending an hour mending a garment that you know you could have fixed in a few minutes when it first needed it! Give your clothes the love and care they deserve and they will give it back to you year after year. Can you tell us about a treasured garment or accessory of yours? What is the story behind it? I have a beautiful vintage mohair coat from Harrods that has a pretty incredible story. While I was in London, an elderly relative of my boss' passed away, leaving a huge vintage clothing collection behind. My boss knew how much I loved vintage clothing, so as a treat she sent me to Madrid with an empty suitcase to choose whatever I wanted. It was truly unbelievable, and I was in awe of the amazing things this woman had in her collection. I collected as much as I could carry, but the real favourite was this coat. What I love most about second hand clothing is thinking about the previous owner (or owners) and the stories that are woven into the fabric. This jacket even had a shopping list in the pocket! I got lots of wear out of it while I was in London, but unfortunately it’s not so useful here in Sydney. Do you have a 'go to' place for repairs or alterations, either for clothes, shoes or accessories, or do you taken them all on yourself? I tend do all my mending myself, but must admit that sometimes I struggle to find the time. It’s Me Made May at the moment and I pledged to mend at least one garment a week for the duration of May as a way of shrinking my giant mending pile. So far I have put buttons on a couple of shirts and changed the elastic in a skirt, so I’m feeling pretty good about that. I must say that I did recently take a couple of pairs of jeans to the local dry cleaner to get them mended. It’s starting to get chilly here and I couldn’t afford to let them sit at the bottom of my mending pile for weeks. Sometimes it’s best just to pay a little bit to get something fixed and get it back into wardrobe rotation. When I finally get around to doing my mending, I love that it forces me to sit down and take a moment to breathe. My days are jam packed now that I have a business, so taking a moment to focus on stitching and reflecting on the story of the garment always relaxes me. Stitching really is good for the soul. Having lived in London for a few years you are now based in Sydney, via travels in Europe - are there any clothing or shoe shops that you always make a beeline for in the UK, Oz or elsewhere? I am a charity shop junkie. Whenever I travel I just love exploring charity shops and grabbing some souvenirs to take home. I find it so interesting to see the kinds of clothes that are available in particular places, as well as what’s cherished (and what’s not). So far, the most amazing charity shops I have found are in Lithuania. I have a couple of great shirts and a little black flared skirt which will always remind me of my visit there. While I was in London, I found some great things in the charity shops in Pimlico, so I guess that would be next on my list. I am hoping to get back over there this year for a visit and checking out the Everything in Colour workshop is definitely high up on my list too. If I am going to buy clothes new, this is definitely the type of business I’d like to support! What one main piece of advice would you give to someone who wants a more ethical wardrobe? The first thing I would say is start with a good wardrobe clear out. Before buying anything new it is always a good idea to work out what you’ve already got (it is surprising how much you can forget about). Consider altering older pieces to give them a new lease of life or to bring them up-to-date with current trends. This could be as simple as getting a pair of wide leg jeans taken in, or getting a collar replaced. If you can’t find what you are looking for in your wardrobe, try shopping second hand before hitting the high street. Head to your local charity shop, go to a clothing swap or see if you can find what you want second hand on eBay. With shopping second hand you need to be a little more flexible and patient, but you can really find some amazing things. It may not be exactly what you were looking for, but it may be even better. If that fails, I would suggest buying pieces that are good quality and classic. Invest in something that you know you’ll be able to wear year after year and won’t go out of fashion quickly. Or even start sewing! You can make some incredible things with a few basic sewing skills and then you can choose exactly how you would like it to look (and fit). Who or what is your wardrobe inspiration? My wardrobe inspiration is my lifestyle. 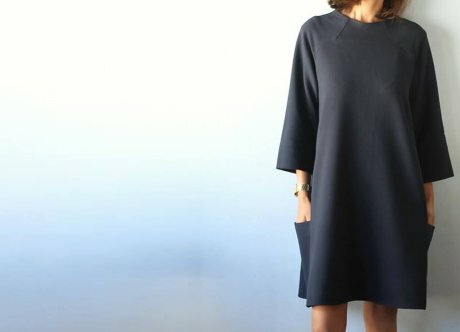 Before buying or making anything, I always think about how I would actually wear the garment, and what it will work with in my existing wardrobe. There is no point making a wardrobe full of ball gowns, when most of my days are spent with my sleeves rolled up making patterns. I think about the colours I feel great wearing and how different colours and prints work together as outfits. I also think about the fabrics I prefer to wear. Wearability and functionality have definitely become the most important elements in my wardrobe since I started my business. I need to look professional and put together, just in case I have a meeting, but it also needs to be comfortable and practical for what my work involves. It is all well and good to prance around in silk all day, but it’s just not practical for my lifestyle. I love wearing anything with pockets, so think about that when I am buying or making clothes. There is a great project by Colette patterns called Wardrobe Architect which can be a great way to think about and reflect on your personal style, and plan for the future. Are there any repairs you’ve carried out that you are particularly proud of? 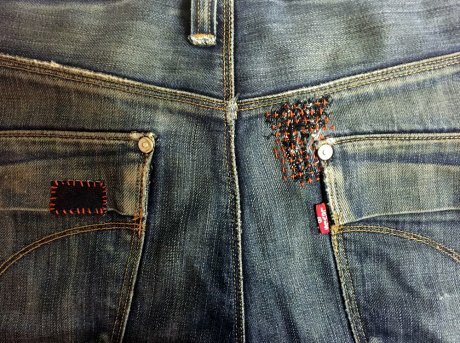 I am most proud of some visible mending I did on my partners jeans. It’s nothing fancy, but it looks good and they have held together well. I also love how proudly he wears them, showing off my mend job to whoever will look. I enjoyed sewing these so much that I am secretly hoping for another rip! What should people look out for when buying clothes and shoes? For example, should they consider whether they can be repaired or altered in the future? I think it’s really important to think about how you are going to wear a garment and how it will fit into your existing wardrobe. You may love that crazy tropical print, but does it go with anything in your wardrobe? Do you think you’ll still like it next season? Is it a pain to clean? Go for neutral colours that don’t date and fabrics that are easy to care for. Consider how clothing could be altered in the future to keep it up-to-date or how it could be mended. See clothing as investment that needs to be taken care of. If our car breaks down we don’t throw it in the bin, we take it to a mechanic. Expect to do the same with your clothes. What is an easy repair to attempt if you are new to it? Any tips for where to look for help or good resources? Anything denim. I think that everyone owns a pair of ripped jeans and they are a perfect place to start your mending journey as the fabric is sturdy and easy to work with. Distressed and mended denim is always going to be beautiful too, so it doesn’t matter if your first go isn’t quite perfect. I am just so inspired by Japanese mending techniques - sashiko and boro - so I think looking up those techniques on Pinterest is a great place to start. It is a really simple technique, so all you need is a little bit of time, a patch of fabric and a needle and thread. Also check out the #visiblemending hashtag on Instagram. If that doesn’t get you inspired to start mending, I don’t know what will! For more tips, hack and 'how-tos' visit Emily's blog. 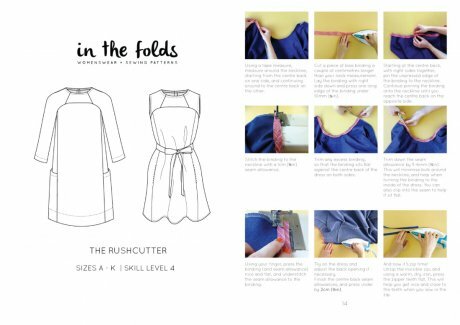 The Rushcutter pattern is available to buy from In The Folds. For more about #MendItMay and to get some more mending inspiration visit My Make Do And Mend Life. The Good Wardrobe Bristol is live! Fashion Revolution Day 2015: Get Involved! Time for a fashion revolution! Do you know the true cost of your clothes? The Observer Ethical Awards: how 'Well dressed' are you? The Good Wardrobe goes live! 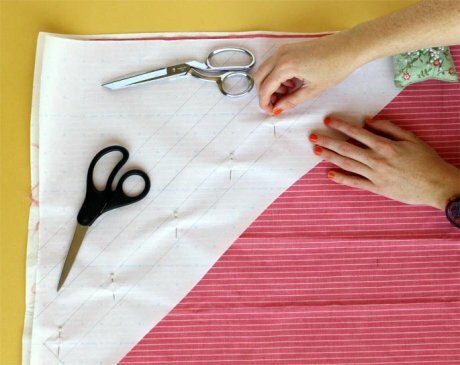 Pledge here to share your skills and learn more about our campaign to get London sewing. Hire/borrow a sewing machine for about a month June 2015. Cupro and/or tencel in London?